It’s almost like Prometheus was prophesying the findings published today. 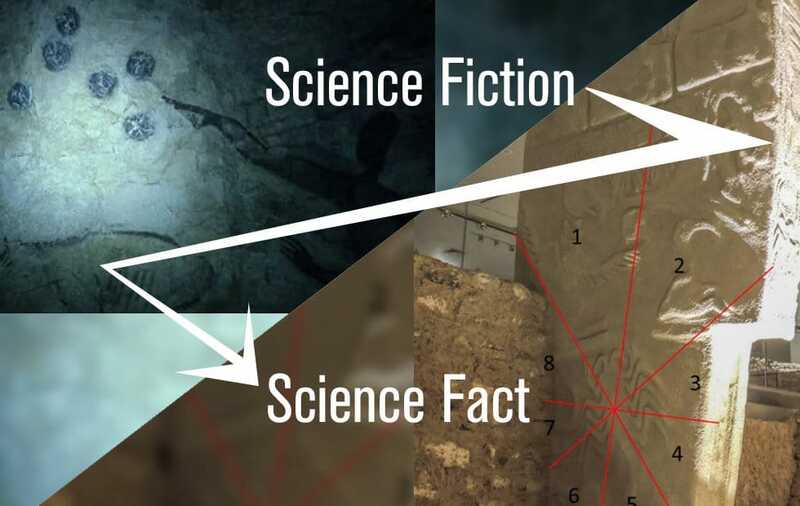 In the film, researchers discover the same set of symbols depicting a single star constellation in multiple (newly discovered) ancient caves across the planet. In today’s study, researchers analyzed already-known archeological sites, finding a set of symbols representing an array of constellations that track to our night sky today. Once a set of astrological symbols was found in caves and other ancient structures across Europe, these scientists used rabiocarbon testing to place or re-place them in history. They then tracked the movement of the Earth and the probable view that these ancient people had at the time they were carving and/or painting these symbols. If the symbols and their positions did not match up with the constellations as they appeared at the time the symbols were made, these researchers’ interpretations would be false. But, as the radiocarbon dates and the constellation positions of their associated symbols show, the two are well within the bounds of reasonable correlation. The software the researchers used was Stellarium (for archaeoastronomical dating). They used such structures as the Vulture Stone at Göbekli Tepe, the animal symbols at Neolithic Çatalhöyük, and Palaeolithic cave art at multiple locations throughout Europe. The paper cites the Aurignacian Lion Man of Hohlenstein-Stadel, Germany, Magdelanean Altamira in northern Spain, and the Shaft Scene at Lascaux, France. Above you’ll see ancient Anatolian bear symbols appearing at three separate ancient locations. One of these alone can be interpreted as many different possible symbols – but when seen together, they become clear. Break out your history books, it’s time to do a few edits. You can learn more about this subject in a paper authored by Martin B. Sweatman and Alistair Coombs called “Decoding European Palaeolithic art: Extremely ancient knowledge of precession of the equinoxes.” This paper was published on November 27th, 2018 in the Athens Journal of History. You can find this paper with code arXiv:1806.00046 [physics.hist-ph] as of this week. This paper was originally submitted by researchers on the 31st of May, 2018.